Port Chester, NY: Westchester Magazine features local eyewear company Zyloware Eyewear in the latest “Money Talks” segment for January 2017. Westchester Magazine, a lead publication in the Westchester county area of New York, features eyewear manufacturer Zyloware Eyewear in the most recent issue of the 914 Inc. “Money Talks” segment. The article is centered around the history of Zyloware Eyewear and how the company has grown to where they are today. 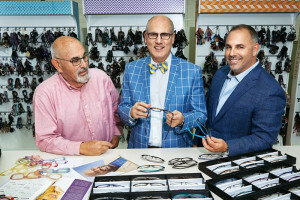 Jamie Shyer, co-CEO/Chief Operating Officer and Chris Shyer, co-CEO/President of Zyloware shared with the publication how the family-owned eyewear maker competes by combining fashion trends with smart business strategies. Zyloware, now in its third generation of ownership, has been in Port Chester since 2010 after relocating from Long Island City, NY to a new 40,000 sq. ft. state-of-the-art facility. Since 1923 Zyloware has been an innovative supplier to the optical industry. The first to license a celebrity eyewear brand – Gloria Vanderbilt, Zyloware’s celebrity collections also include Sophia Loren, Daisy Fuentes and Randy Jackson. The company also aligns itself with designer portfolios such as Leon Max and Via Spiga, which provide runway looks and sought-after fashion trends. The most recent face to join Zyloware’s impressive portfolio is NBA Hall of Famer Shaquille O’Neal – who’s collection taps into the “athleisure” trend by marrying cool technical products with eyeglasses.